Wander labyrinth-like streets (photo: Edwina Hart). Morocco is a treasure trove to explore, but it pays to get off the beaten track to discover one of its most precious jewels, Chefchaouen. Hidden away in Morocco’s Rif Mountains is a sleepy, storybook town. Chefchaouen (pronounced shef-sha-wen) cascades down the rugged mountainside to nestle between the dramatic peaks. But it’s not scenery, the rich cultural tapestry, the romance of a faraway place, or even the beguiling history of this walled city that first captivates those who visit. It’s the colour: an arresting, luminous palette of powdery blues. Travellers are instantly enchanted as they gaze upon the cobbled lanes, terracotta roofs, white facades brightened with splashes of brilliant blue paint, and intricately tiled doorways framed by bougainvillea. If the ‘Blue City’ were a jewel, it would of course be a sapphire, that sparkles various shades depending on the light – from Majorelle to azure, and a harsh Arctic blue in the midday sun. It’s a fantastical sight to encounter as my partner and I round the final bend of a winding four-hour drive from Fez. I breathe in the crisp mountain air and feel a world away from the mayhem of the Imperial cities (Fez, Marrakech, Meknes and Rabat) and the sweltering North African heat. Set along what was once an old caravan route between Tangier and Fez, Chefchaouen (or Chaouen as it is sometimes called) is one of Morocco’s hidden gems. Many travellers overlook northern Morocco in favour of the well-worn tourist trail of the south: ‘the capital of cool’ Marrakech, beachy-chic Essaouira and the Sahara. The steep, colourful labyrinth of alleyways is traversed by Berber tribespeople, Islamic locals, and dreadlocked hippies. The offbeat enclave has a slow pace that has held an allure for bohemians since the 1960s – and the haze of that era hangs in the air, as kif (cannabis) is still grown in the surrounding countryside. Arrange for an accredited private driver to Chefchaouen from Tangiers (two and a half hours) or Fez (four hours). There are more than 200 small hostels and boutique hotels. Book somewhere in the old medina, as the newer part of town is not as charming. This recently opened guesthouse’s four suites and eight rooms all include eclectic furnishings and antiques. There’s a small pool, Hamman and rooftop terrace, and a simple breakfast is included. This family-run restaurant is a challenge to find but it’s worth the effort. The neighbourly atmosphere and full-flavoured fare means it’s likely you’ll become a ‘regular’ during your stay. This hotel-restaurant is a short drive out of town, but remains a firm favourite for travellers looking for a memorable meal made from garden-fresh ingredients. The owner makes his own bread, olive oil and goat’s cheese. Try the speciality: a thick fava bean soup called bessara. For Islamic religious reasons alcohol is hard to come by. To drink like the locals, head to a sidewalk cafe and order the ubiquitous sweet mint tea (the cornerstone of Moroccan hospitality). Due to the lasting effects of colonisation, Spanish is widely spoken. Locals also speak Arabic, Berber and French, but it’s easy to get by with English too. The Rif region is one of the world’s foremost cannabis producers. Touts typically target tourists but are best avoided. Although it’s readily available, smoking kif is illegal. You’ll soon master the art of a polite but firm ‘no’. five hundred years ago, most of the gorgeous Andalusian architecture in the old town is painted in the characteristic colour. It is said that Jewish exiles from Spain blue-washed the buildings to reflect the cloudless Moroccan sky, serving as a reminder of God’s power. The resulting effect is one of the prettiest medinas in North Africa. Blue upon blue upon blue (photo: Edwina Hart). The picturesque streetscapes of Chefchaouen have become very fashionable of late. Comparable in beauty to the likes of Santorini, Jodhpur or Positano, social media ‘influencers’ have deemed Chefchaouen as infinitely Instagrammable. Although Chefchaouen is welcoming to visitors today, it wasn’t always the case. The city was founded by Moulay Ali ben Rachid in 1471, built as a strategic base camp to launch attacks against the Portuguese stronghold in Ceuta. It soon became a refuge for Muslim and Jewish exiles from Spain fleeing the Spanish Inquisition. 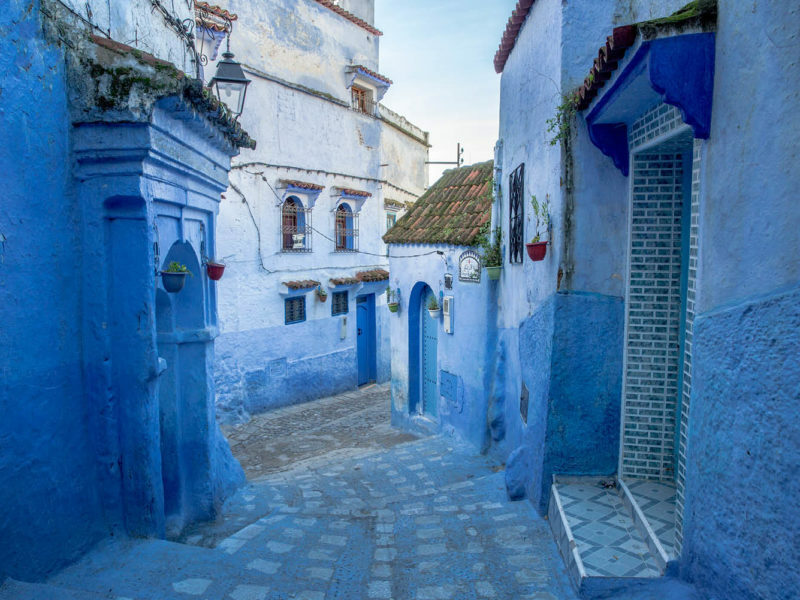 The incredible palette of blue that typifies the streets of Chefchaouen (photo: Edwina Hart). The increasingly isolationist city was closed to all foreigners until Spanish occupation in the 1920s. Only three westerners had managed to visit: a French explorer disguised as a rabbi, a British journalist, and an American missionary who met a grisly fate upon discovery. Although Morocco gained independence in 1956, Spanish is still widely spoken here. A Berber boy meets us at Bab Souk to wheel our luggage over the cobblestones and guide us to the newly opened Riad Cherifa guesthouse, originally a traditional home with an interior courtyard or, in this case, a lofty atrium. Our afternoon is spent basking in the sunshine on the rooftop patio with a plate of sticky pastries and a glass of ‘Berber whisky’, an affectionate name for Moroccan tea, which is a supremely sweet, amber-coloured brew made from fragrant spearmint leaves. A patch of white breaks up the sea of blue (photo: Edwina Hart). Wandering around the ‘Blue City’ feels like stepping back in time. There is a communal wood-fired oven where loaves of bread are prepared daily, farmers sell fresh produce at a weekly market, women in flowing Islamic veils walk children to school, townspeople wash laundry in a nearby waterfall and the mesmerising call to prayer vibrates within the ancient city walls. Chaouen is an exercise in overstimulation of the senses (photo: Edwina Hart). We work up an appetite traipsing through the spice-scented lanes, browsing a string of shopfronts and soaking up the atmosphere at alfresco cafes around Plaza Uta el-Hammam. As evening falls we dine at Restaurant Beldi Bab Ssour, which serves homespun fare in a rustic dining room. Our table is shared with a family who glance up from their meal with welcoming smiles before continuing a conversation in the Berber tongue. The following day, I awake at first light to explore the surreal setting as the soft blanket of dawn amplifies the otherworldly atmosphere. I steal away from the riad and weave my way through the quiet, narrow lanes. It’s empty – save for a few stray cats and a glimpse of a man wearing a traditional hooded cloak (djellaba) before he disappears into the shadows. A typical tiled doorway (photo: Edwina Hart). Chefchaouen is ethereal in the morning mist, the streets cast with an eerie hue before the warm tones of the sun begin to creep over the mountains. 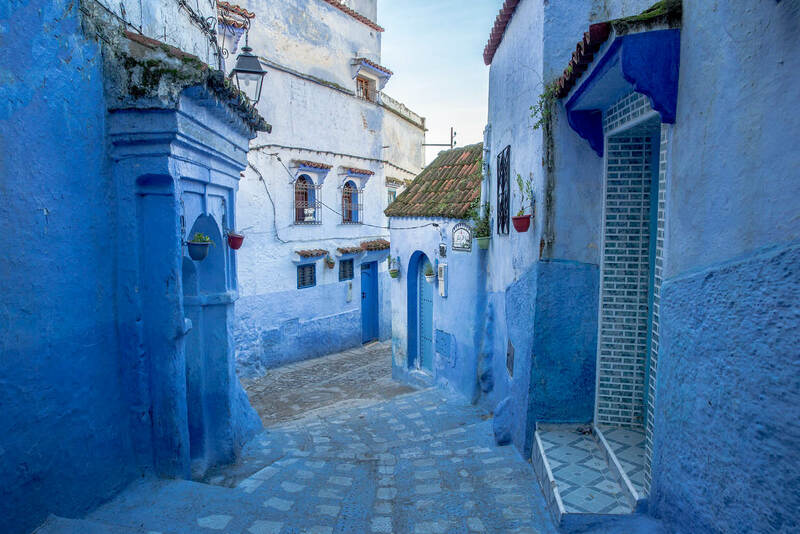 It is a scene that will leave me spellbound for a long time to come, and which, when combined with its other myriad allures, confirms Chefchaouen as a true gem.